Here’s an example of typical planning: bullet journal, essential oils, computer. One year and 12 days ago, I decided to drop my current planning, return my not-yet received Moleskine annual planner, and dive into the Bullet Journaling system. And, now I won’t look back. The Bullet Journal system is the most inclusive, most flexible, most straightforward way of organizing my life that I have ever used. And, it’s just an idea of how to organize in lists. Thank you Ryder Carroll. From left: an Escher inspired planner, We’Moon 2005, We’Moon 2006, and for 2006-2007 a $3 academic planner. The latter got me through my wedding and pregnancy! I have planned things in planners since high school, my first planners being At-a-Glance day planners from the local grocery store, knock offs of Franklin Covey’s system. I later used prettier things with thicker pages, or things that integrated art and moon signs. Eventually, I just dropped into Franklin Covey’s entire system. 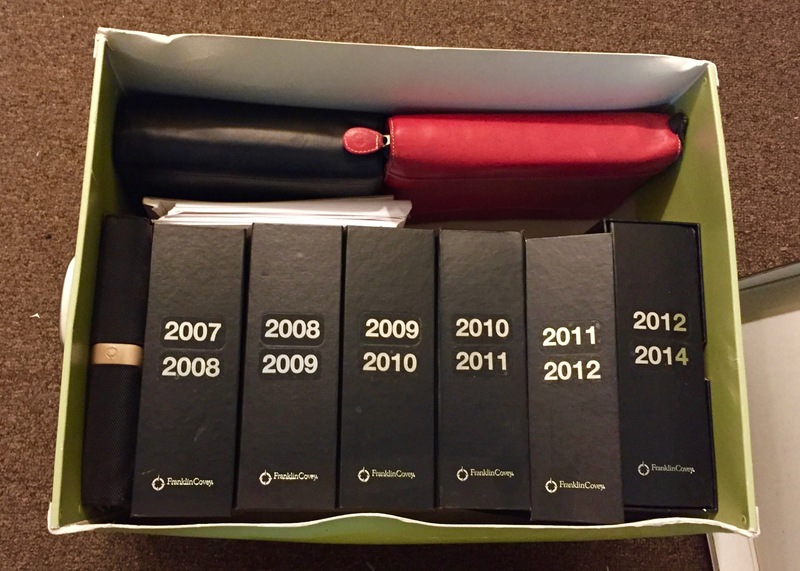 I used that system for almost ten years, spending around $100 every year updating calendar pages, purchasing new covers (the clearance synthetics I purchased never last longer than a year), rulers, plastic carrying cases, and more. And, then, life shifted. 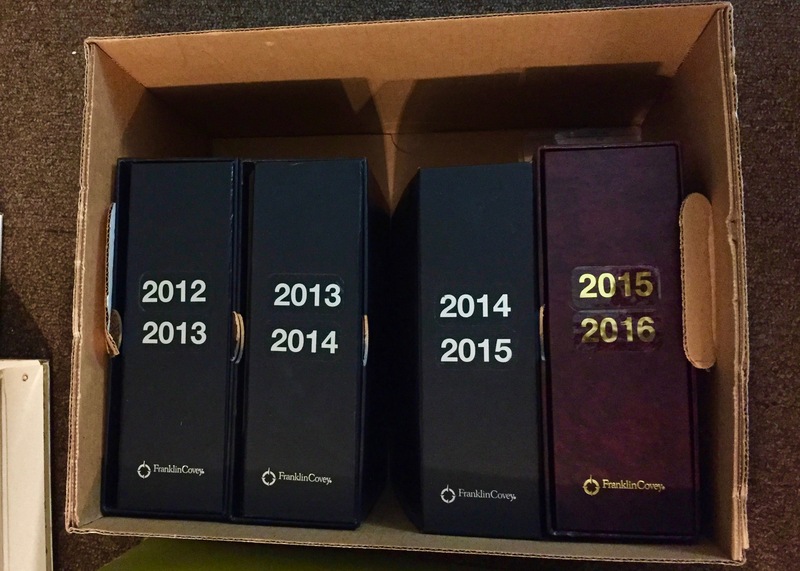 The largest collection of Franklin Covey planners and various binders used through the years. I was fired because I questioned my boss on her choices, regularly. And, my wavering self-confidence faltered even more. Every time I looked at the Franklin Covey planners, it reminded me of plans I didn’t have, work I didn’t have, confidence I didn’t have. So, I needed to make a change. First, I used the Passion Planner. And, then, after six months, I abandoned it. There were many things I liked about the system (size, story, goal focus), but I didn’t stick with it. I had heard good things about Moleskine, so rashly, I purchased their annual diary for $24 and had it shipped to my door. My husband’s review regularity piqued at the back of my mind, so I did a quick search: compare Moleskine’s Calendar to Passion Planner. What I got was Kara Benz’s review of the Leuchtturm dot grid journal compared to the Moleskine. Immediately, I was struck by her efficient review that hit all the things important to me: how does the paper feel, how does it open up, what’s included in the packaging, and (most importantly) how does the pen react to the paper. She described ghosting, not bleeding, she explained, briefly, her favorite pens used. And, she gave a nod to the bullet journal system. “The bullet what?” I thought. And, I was off on a Google search web that I hadn’t experienced in a very long time. Ryder’s video didn’t quite cut it for me, but Buzz Feed peeled back more layers, and I was sold. 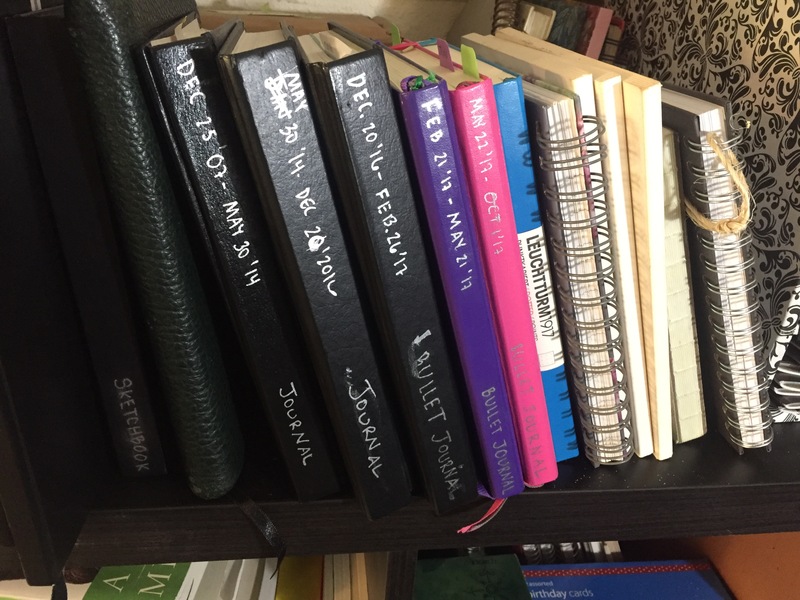 From left: former sketchbook, current sketchbook, sketchbook journals, and then bullet journals, ending with “regular” journals on the right. Before I tried to find this Leuchtturm journal, I decided to use what I have. 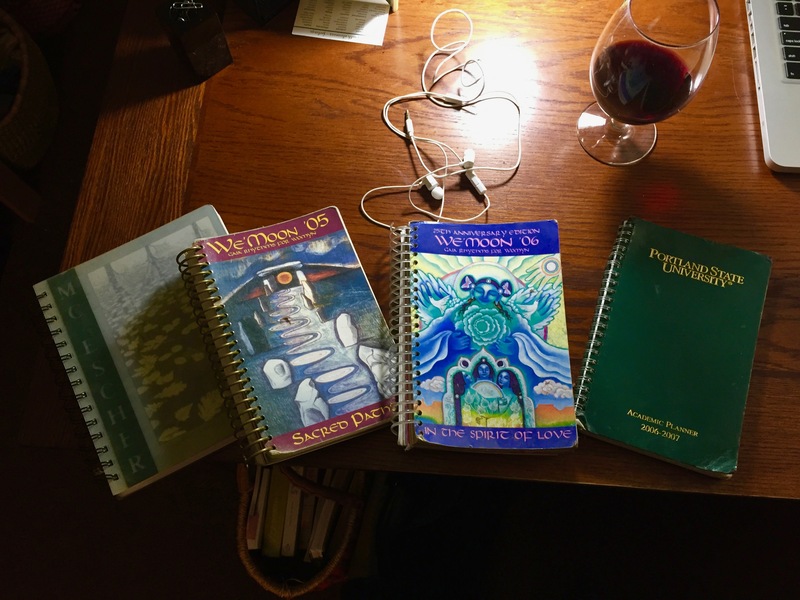 I had some inexpensive sketch journals, purchased several years before, that were blank and awaiting their next use. I finished one journal in two days, and started fresh. This 8.5×5.5 sized journal only lasted two months. This wasn’t going to do, perusing the newly opened art store in my neighborhood, I was shocked to find the Leuchtturm journals, on display, in the front window! I didn’t have to wait for shipping! The beautiful dot grid system, the slight organization (index and page numbers), and the free-flowing pages awaiting whatever I wanted to put on them… I was sold, again. That journal only lasted three months. How could I use a 249 page journal in three months? The next one lasted almost five months, but I didn’t keep up with it like I desired during our summer vacation. And, at that point, I knew I was tired of transferring collections. Luckily, Queen Bee Creations had just created a Traveler’s Notebook that fit my Leuchtturm, and my system is now complete. For the time being. Monthly Log – gridded that separates into important notes, all day events, morning, afternoon, and evening. Weekly Log – I need a week at a glance to see how the pieces fit together. Daily Logs – repeating and/or amending what was written on the weekly log. This piece is perhaps the most important to me. I do not write ahead very far because I have phone calls, classes, and meetings in which I take notes. And, I can take a lot of notes. One weekend seminar can yield 40 pages written in notes, with barely a thought. Monthly Trackers – monthly goal setting, planning for events, and other general notes. I expect my “collection” journal to last a year or more, and in between I will use between 3-5 journals for daily planning. What is your favorite way to manage your day? Here's a recent example of a day: brush lettering header, bullets of events and to-dos, quick notes on something I want to pay attention to. Here's another example of typical planning: bullet journal, essential oils, computer. More essential tools from left, clockwise: bullet journal, essential oils, computer, tablet, year end planner (Leuchtturm, slim, squared (not dot grid 🙁 ), daily planetary guide to watch the planets move.